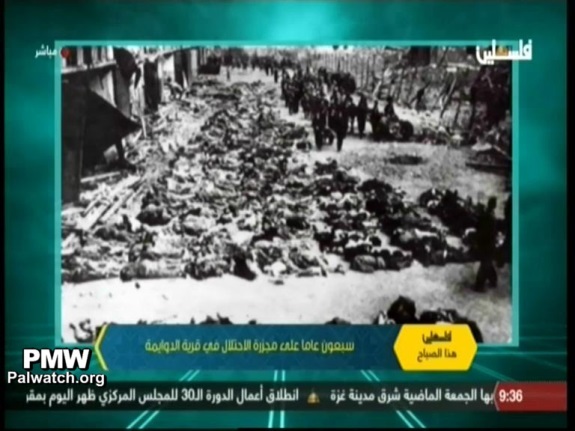 A senior Palestinian academic taught adults on PA TV: “There was no Dachau, no Auschwitz; these were disinfecting sites.” A Hamas TV documentary explained that it was Jewish leaders who planned the Holocaust, in order to eliminate Jews who were "disabled and handicapped”. 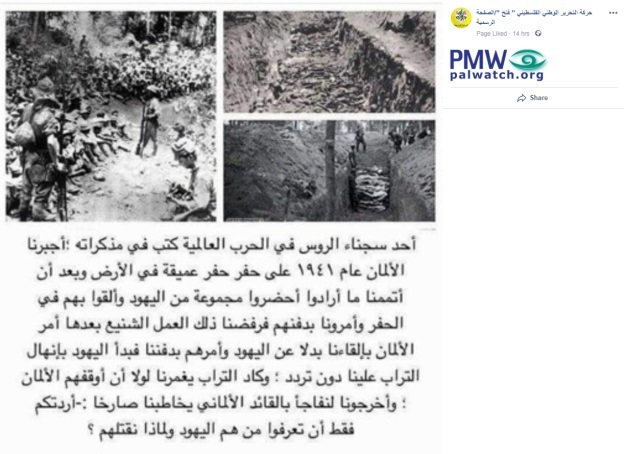 Schoolbooks produced by the Palestinian Ministry of Education teach the history of World War II in great detail except for the history of the Holocaust, which is totally ignored. One history book goes so far as to teach that Nazism was a racist ideology and that there were trials of Nazi war criminals, but it leaves out that Jews were the target of the racism, and the crimes for which the Nazis were on trial. Palestinian education erases the actual Holocaust from history and usurps the word “Holocaust” or its own wide range of malicious libels. This video depicts a PA TV children’s play teaching that Israel burned Palestinians in ovens. They opened ovens for us, to bake human beings. They destroyed the villages and burnt the cities. And when an oven stops burning, they light a hundred [more] ovens. Their hands are covered with the blood of our children." that they are a nation which spreads destruction all over the world." This essay published in 2011, yet in spite of broad international condemnation following PMW’s exposure, it was not removed from the Palestinian educational website Zayzafuna, when we last checked in Oct. 2013. Since 2012, there have been a number of statements by the PA or PLO officials acknowledging the Holocaust. This has not yet been incorporated into PA formal education. Editorial in official PA daily: US-led Warsaw Conference is "a plan to carry out a 'holocaust' against this [Palestinian] cause"
Perhaps it is not a coincidence that Warsaw will serve as the site for the convening of this conference [on] the American administration's failed deal; this is the just ruse of history, which wishes to remind humanity that the holocausts of racist eradication that Nazi Germany carried out in Poland can happen again today as a result of this American policy. It wishes to turn Warsaw – as the Nazis did – into an arena of holocaust of eradication against a small, oppressed, and tortured people, the Palestinian people." 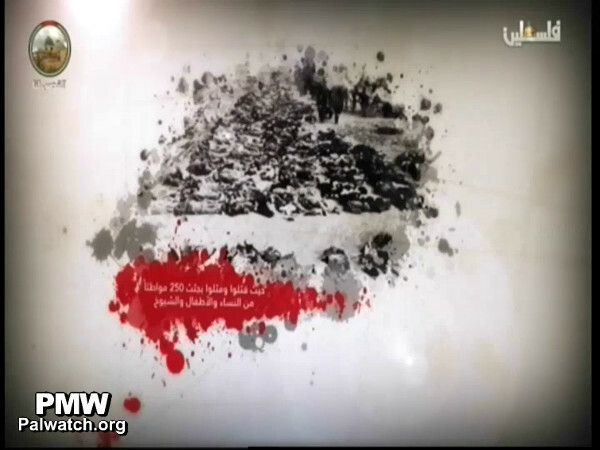 PA TV showed a picture of dead bodies arranged in piles on the ground, presenting it as from Al- Dawayima. The source of the picture is the Nazi concentration camp at Nordhausen, originally a subcamp of Buchenwald, and the bodies shown are those of Holocaust victims. Masoud Rayyaan, lecturer on Islamic Shari'a at Al-Quds Open University, in Friday sermon on official PA TV: (Quran): “Proceed throughout the earth and observe how was the end of those who denied”... The occupation government hasn't learned from history, from the corruption of the Children of Israel the first and second time. It hasn't learned. They [The Jews] didn’t learn from what Nebuchadnezzar did to them. They didn’t learn from what Titus, the great Roman leader, did to them. They didn't learn from what Hitler did to them, and the kings of Europe, and Spain – they didn't learn. They have continued to behave the same way: The mentality of arrogance toward other people. The mentality of superiority over other people. The mentality of seclusion, the mentality of settlement. This mentality, an ideology of planning and systematically working to incite wars and strife in the entire world. Those [Jews] have not learned from the events of history." "Today, the most prominent mosque that the people are prevented from coming to is the Al-Aqsa Mosque. Barriers, closures, the closure of routes and gates,and limiting the ages [of worshippers] – this is a new craft that we are hearing of for the first time: You are not allowed to pray because you are younger than 40, and you are forbidden… how nice! What is this? In what period of history are we living? In the Inquisition's courts? What was done to them – in the ghetto, in the Inquisition's courts, and in the Nazis' courts – they want to do this to people. Are we in the Inquisition, or what? Israeli Zionist Inquisition courts that are attempting to demean human dignity, the dignity of the people's religion, and the people's faith in Allah...'"
The president did not deny the Holocaust, but rather diagnosed the causes and background of the Holocaust. He also did not turn his back on peace, but rather declared his adherence to a political arrangement, as he understands that the Jews have been misled – that the Zionist movement forced them to immigrate to Palestine – [and] do not bear the main responsibility; those who are fully responsible are those that stood behind the Zionist colonialist enterprise…"
Israeli Prime Minister Benjamin Netanyahu's actual statement on May 2, 2018, regarding PA Chairman Mahmoud Abbas’ anti-Semitic speech to the Palestinian National Council on April 30, 2018: "Mahmoud Abbas gave another anti-Semitic speech. With utmost ignorance and insolence he claimed that the Jews of Europe were persecuted and murdered not because they were Jews, but because they engaged in usury. Mahmoud Abbas again recites the most despicable anti-Semitic slogans. Apparently a Holocaust denier remains a Holocaust denier. I call on the international community to condemn Mahmoud Abbas' grave antisemitism, whose time has come to pass from the world." Op-ed in PA daily: Trump is "colonialist, neo-racist, Hitleresque, Balfouresque"
PA TV misrepresented a photo of concentration camp victims and Sabra and Shatila victims as Arab victims of Deir Yassin Massacre in 1948, falsely claiming the Jews "burned the women and children in the village's oven"
The PA TV video, which was broadcast on the anniversary of the Deir Yassin battle, also included a photo of victims of the massacre at the 1982 Sabra and Shatila refugee camp by Christian Lebanese, which was likewise misrepresented as showing Arabs who were killed by Jews. 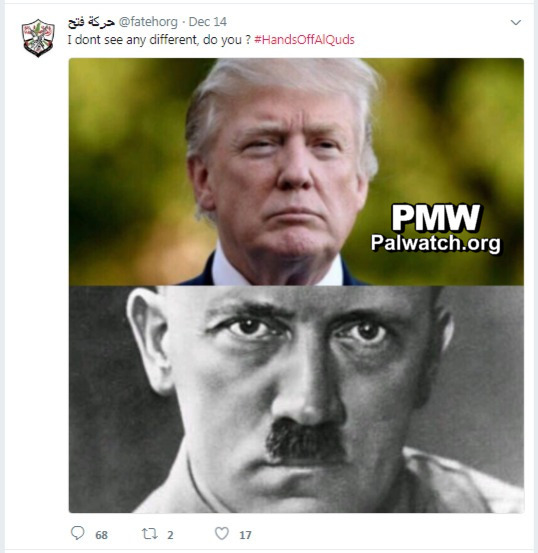 Fatah official: US President Trump is "Gestapo," "ignoramus"
PA Chairman Mahmoud Abbas: "I finished university and obtained [a degree] in law, and afterward I received a doctorate from Moscow from the Institute of Oriental Studies [of the Soviet Academy of Sciences] in a surprising subject, for which I am insulted to this day in Israel. It is the secret connections between Nazi Germany and the Zionist movement. How? What? What happened? Actually, I examined it in depth and reached the conclusion that there was close cooperation that began in 1933 and did not end in 1946. What is called economic and human cooperation that is connected to the expulsion of the Jews. This is firm and there is no dispute about it (sic., many have disputed and debunked the claims of Nazi-Zionist collusion). From here– this is one of the books for which I got a doctorate, and I had no choice but to explain myself through ideas that I want to suggest, and I wrote 20 books about the Zionist movement. This has no connection– it was published, all of these books were published. Afterward I began to write history, our history. This history cannot be published as I wrote it in a realistic manner. In other words, I mean that I wrote down everything that happened, without flattering anyone. What happened - we did this, and what happened - I spoke about it. I have written 70 books, but they have not been published." Fayez Abbas: “[Bennett:] 'The Palestinian people and leadership that are inventing the past, who were in those lands.' It seems that Naftali Bennett’s grandfather’s grandfather’s grandfather lived here. At the most, his father came from Poland, at the most. Should those who have no history and no past- it is all false fables about the Land of Israel and Abraham, that he is their father and grandfather, and their grandmother Sarah. It is all a big lie..."
Fayez Abbas: “Him, them, they falsify history. It’s as if someone would come and say: ‘There was no Holocaust of Jews in Nazi Germany. Six million Jews were not killed in Germany. That is a big lie, Yair Lapid.’"
"Bahraini, Palestinian, and Arab official and national figures submitted a memorandum to UN Secretary-General António Guterres as a sign of solidarity and support for the rights of the Palestinians in the 1948 territories (i.e., Israel), and this was for International Day of Solidarity with the Palestinians of 1948 (apparently refers to Solidarity Day for Palestinians in Israel, observed on Jan. 30 since 2016, not an official international day – Ed. )… The signatories to the memorandum expressed their absolute support for the affairs of the Arab-Palestinian public, which has remained in its homeland and on its land and the land of its forefathers since the Nakba (i.e., “the catastrophe,” the Palestinian term for the establishment of the State of Israel) that befell the fighting Palestinian people in 1948… In a petition to Guterres, the memorandum said: ' We wish to present before you some of the acts being carried out by those you described as victims of the Holocaust, so that together with you we will be vigilant about the spread of hatred, and so that the world will know who the real victims of the large holocaust that took place in 1948 are, and who the people is that is undergoing a holocaust now, in the 21st century, before the eyes of the entire world.'" Leader of the north branch and Secretary of the factions and Fatah in Nahr Al-Bared Abu Salim Ghneim gave a speech on behalf of Fatah and said: …‘We see the Jerusalem Intifada and its heroic popular resistance as a national achievement that came in response to the racist and criminal policies, the summary executions, the burning of families, the continuation of settlement, and the Judaization and tearing apart of Jerusalem, and also as a natural response to [US President Donald] Trump's Nazi decision to consider Jerusalem the capital of “Israel,” and his threat to transfer his country's embassy to Jerusalem.’"
Director-General of the Jordanian Dar Al-Orouba Center for Political Research Sultan Al-Hattab: "[PA President Mahmoud Abbas] wanted to educate all the listeners at the [PLO] Central Council regarding the depth and roots of the struggle over Palestine and the aspirations regarding it. Thus these aspirations began to consolidate within the Zionist movement, which led to the Balfour Promise (i.e., Declaration) through a conspiracy between Zionism and the colonialist states. President Abbas wrote about this conspiracy through a large collection of books whose number exceeds 60, the most prominent of them being [about ] the conspiracy and alliance between Zionism and Nazism, and also between the different European Imperialist [states] - and especially Britain which had [British Foreign Secretary Arthur] Balfour of the ominous promise - and Zionist Jewish [Lord Lionel Walter] Rothschild, who corresponded with [Balfour] (Referring to Abbas' book The Other Side: the Secret Relationship Between Nazism and Zionism, based on then thesis he wrote in 1982 –Ed.)." The image shows a photo of US President Donald Trump at the top, and a photo of Nazi leader Adolf Hitler at the bottom. The post comes as a response to the US recognition of Jerusalem as Israel’s capital, see note below.